The recent student placements at CWL represent the first that have been available to students at Ayrshire College. The placements are now possible following the ‘Service Level Agreement’ signed and agreed by both CWL and Ayrshire College in September 2014. The SLA agreement allows for students studying on the City and Guilds Wind Turbine Technician course the opportunity to attend a work placement scheme at Community Windpower. Interested students at the college were interviewed for the placements and successful candidates attended the placements during their Easter holiday period in April 2015 to avoid missing college lectures. Students Andrew Brown and Rhys Mcicken became the first students to successfully complete the extra curriculum programme at CWL. While at CWL, Andrew and Rhys spent half their time with the ‘Projects team’ and the other half with the ‘Operational / Technical teams’. 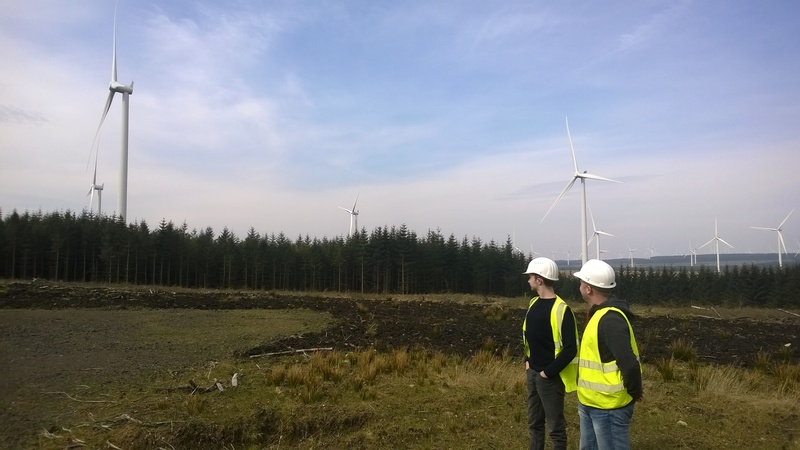 The placement scheme also included a site visit to CWL’s Calder Water Community Wind Farm, in South Lanarkshire and CWL’s Dalry Community Wind Farm and its extension, Millour Hill Community Wind Farm, which are both located in North Ayrshire. “This was the first Community Windpower placement scheme available for students at Ayrshire College. There was a lot of interest, we interviewed 11 students and the decision on the final two students was very difficult. Having said that, we were delighted with the students we did select, Andrew and Rhys, as both got really involved in the programme, which can be quite demanding. They are encouraged to cover a range of subjects and different aspects of the business. Even though the programme is thorough and challenging, I hope they both enjoyed their time here with us too! The basic structure of the student programme is fixed, i.e. the students split their time equally between ‘projects’ and the ‘technical teams’, there is always a degree of flexibility allowed to suit each student’s particular interests and abilities. On the site visits, we made arrangements for the students to meet our Operations Manager, Owen Powys, who is responsible for managing our operational fleet and the technicians working on our sites. The meeting with Owen at Calder Water Community Wind Farm gave Andrew and Rhys a great chance to speak to someone currently working in their intended field to discuss the best routes to market and the options available to them once they finish their studies. Andrew Brown successfully completed the work placement scheme in April 2015, had the following to say about the CWL student programme; "I thoroughly enjoyed my time with Community Windpower. I have learned a lot and I am very sure this will benefit me for future employment". 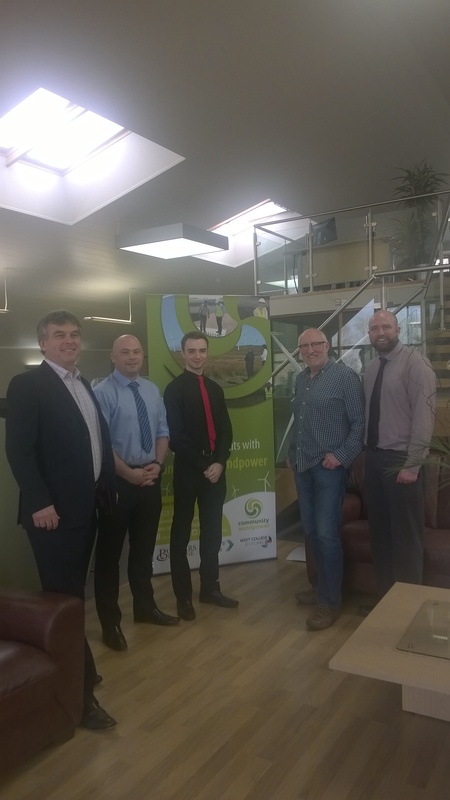 From left to right; Rod Wood, Managing Director at CWL, students Andrew and Rhys from Ayrshire college, Jim Armstrong, Engineering Lecturer at Ayrshire College, Ben Fielding, Project Manager at CWL at the CWL head office, Frodsham, Cheshire in April 2015. The placement scheme requires the students to relocate to Chester for four nights a week, staying in a Bed and Breakfast before returning home at weekends. This adds to the overall work ‘experience’ and it is often the first time students have done anything similar or have worked away from home.